This mother's piece about being "terrified" of pregnancy does not hold back—and we bet a lot of you can relate to what she's saying. 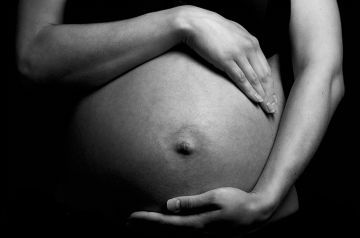 When women learn they're pregnant, their reactions almost always look a certain way: To-be moms are elated and emotional. We don't often hear our pregnant friends admit that they're anxious about delivering. Movie characters rarely discuss how scary the prospect of actually raising a child is. New moms seldom admit that yes, childbirth really is as painful as you'd imagine. But one mama dared to go there: Michelle Zunter recently blogged about her fears surrounding pregnancy, and it's a read that will resonate with so many women. Let's face it: Pregnancy can be downright frightening. Between the morning sickness, the pain of childbirth and the physical effects that linger long after you've given birth....well, let's just say it's not all rainbows and sunshine and glowing skin. Zunter came clean about her real feelings towards pregnancy—the blogger behind The Pondering Nook admitted that pregnancy "terrified" her. "Being pregnant is one of those strange, surreal experiences that causes you to feel both fully connected to your body and also disconnected from it," Zunter wrote on The Huffington Post's blog. "You’re very much aware of your body while you’re pregnant for the clear reason that your pregnancy is controlling how you feel physically, mentally, and emotionally. This can also be a disconnecting experience because many women like myself are used to being in control or at least feeling in control of our own bodies. Then, one day, you’re just not in control at all because you’re carrying a human being inside of you." We caught up with Zunter to learn more about she decided to put this sentiment out there—and how other mothers have reacted to it. "I wrote the piece because it's been on my mind a lot about how unprepared I was for giving birth compared to a lot of other moms. It's not that I wasn't capable of being more organized or involved in pregnancy classes, but it was more like I just had a hard time dealing with the reality of it. I was very excited to be a mother but as far as the actual birth, I was petrified," Zunter told Fit Pregnancy. "I figured I can't be the only one out there who has experienced these feelings. With all the pregnancy books and magazines out there, it's easy to feel isolated if you're not totally on board with the latest trends in birthing techniques, baby gear, and so on. I can't be the only one who just wanted to hide while pregnant until it was all over and I could see my baby." Can you relate to what this mama is saying? Celebrities like Kelly Clarkson, Molly Sims and Ellie Kemper have been similarly forthcoming about how rough pregnancy can be. While it's all worth it in the end, pregnancy isn't easy and there's nothing wrong with voicing that reality. Other moms seem to agree with Zunter's point: "It seems other women are relating to me and that's why I wrote the piece," she said. "It's always nice to read about something you may have felt ashamed to talk about openly. I think we all want to appear brave and strong as women—especially on the journey into motherhood. It's not easy to admit you're afraid to be pregnant, give birth, and be a mom—especially for the first time."